Enjoy a private dock, lake views, and nearby restaurants and parks. Liberty Lodge is one of our Signature Series homes in Liberty Lake, WA—situated between Coeur d’Alene, ID and Spokane, WA. This convenient central location easily allows you to enjoy both areas during your visit to the Inland Northwest. Liberty Lake is a small, bustling community with a great selection of restaurants and activities. An award winning local favorite is Hay J’s Bistro, open for lunch and dinner. Outdoor enthusiasts will love the area’s multiple parks, including Pavilion Park that’s complete with a children’s splash pad. You can also immerse yourself in nature at Liberty Lake Loop Trail—a moderate and well marked 8.5 mile hike. The golfers in your group will enjoy the community’s 18-hole Liberty Lake Golf Course or the 9-hole Trailhead Golf Course. With enough beds for 20, this is a fantastic option for a variety of travelers, including larger groups. You won’t feel cramped at all in this massive waterfront home with room for the whole family to spread out. The great room style floor plan includes the kitchen, living room, and dining area. You’ll enjoy preparing meals surrounded by windows and beautiful mountain views in the kitchen. A large island provides extra space for meal prep and seating for 5. The adjacent wooden table seats 8 more. You can curl up by the fireplace in the spacious nearby living room or relax on the comfy furniture as you gaze out at Liberty Lake through the windows. This level of the home also offers access to the large deck, complete with a BBQ, table, and ample seating. When you’re not socializing on the deck follow the staircase to the backyard where you can enjoy the nice flat area above dock that’s perfect for picnicking, laying out a towel by the water, or just reading a book in the shade. 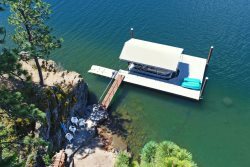 The home’s private dock is large enough for a smaller ski boat or pontoon as well as any number of kayaks, canoes or paddle boards. Liberty Lake is great for water sports, including jet skiing, boating, and swimming. With 100 feet of boardwalk, there are several locations to relax by the water. In the evenings, you can gather around the fire pit and watch the sunset. There’s a spot for everyone to sleep in the home’s 7 bedrooms and 4 full bathrooms. The master bedroom features a king bed and a luxurious attached master bathroom. Views of the mountains and Liberty Lake can be seen from the window above the soaking tub or you can opt to use the adjacent standing shower. The other three bathrooms in the home are also equipped with standing showers, giving everyone space to get ready for the day. If you have kids in your party, they’ll love the bunk rooms! One room has 3 bunks beds and the other has a fun summer camp style 4 level bunk—plus a foosball table in the open room. All ages will enjoy the great balance of scenic seclusion and access to city amenities provided at Liberty Lodge. The team was outstanding Helped me locate this "lake house" as my 4 year old grandson calls it. He wants to go back to the Lake House. It was large enough to house our whole family with space to escape and have some small group talks. the view was to die for. we stayed a week and found it to be a great home base for some other adventures and a great place to chill in the lake and have family time. VRA team members were awesome to work with and very quick to respond to any questions we had. Going to book this property again! Home was gorgeous. Fishing for bluegill from the dock provided hours of fun for all. The beds were very comfortable. Appreciated how well stocked the kitchen & bathrooms were. We liked how clean & well kept the property was. Lindsey was fabulous. Professional, helpful and open with the inability to get to our requests right away. Her whole demeanor was appreciated. The house is fabulous and the facilities washer, dryer, dishwasher help make your stay as relaxed as it can be. The lake is warm and fun and with two docks easy to have several people on them at one time. Fun place. the team was fantastic. All of them were so positive and so excited for us to be at the house. When we got to the house the key code wouldn't work and Lindsey stayed on the phone until it was fixed and we were all inside. The check out went the same way, so friendly and upbeat. We had such a great time at the Liberty Lodge. 23 of us from age 3 to 73 were able to enjoy the house and the dock alike. We would go back. We loved staying at your property. It exceeded all our hopes and expectations. The only difficulty was in leaving.